Windows and patio doors are an important investment. They can reduce energy costs, add to your home's curb appeal, improve ventilation and make your home more comfortable. That's why it pays to learn about the major components of patio doors and windows. These details can make it easier to choose the right products for your new or remodeled home. Every Milgard window and patio door begins with a high quality, well-crafted frame. Learn more about our frame material options to determine which Milgard series is right for your home. Choose from vinyl, fiberglass, wood or aluminum. You have a lot of options when it comes to glass. Laminated glass provides sun protection and noise reduction, while obscure glass offers privacy options. Learn more about glass tints and textures. Grids can add a special touch to your windows and patio doors. If you are looking to match an architectural style, or you want to make a decorative statement, there are many grid options available. From simulated divided lites to grids between the glass, get creative and make it your own. Milgard windows and doors are equipped with quality hardware that is easy to operate and can help provide added security to the home. When considering hardware for windows or patio doors, there are four main things to keep in mind: the lock, opening and closing handle, tilt latch and the finish. Milgard screens keep pests out and air flowing in. Consider our PureView® screen as an optional upgrade featuring smaller yarns, increased light transmission and a better view. 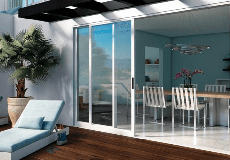 For patio doors, retractable screens are also available. New to window and patio door jargon? Let Milgard help you learn “how to speak window” with diagrams and the relevant terminology you need to know, that describes window and patio door components.